Creating custom shaped Forms in C#.NET can be of infinite uses. Most people use them to simply recreate a non-rectangular Windows Forms that stand out from the competion and wows users. Let's see how to use the TransperancyKey property to create a stunning custom shape Form with pure C# code. All C# irregular-shaped Windows Forms, however created, need a reference shape. TransperancyKey will also require the referenced shape to becomes the background image of the Form. With that said we need to create a fancy background image. For this example I created an abstract shape using Photoshop (included in the project files). Feel free to create one with any image creating software. The important concept here is, the background image needs to have a contrasting background color. Also another important tip is, avoid anti-aliasing. The TransperancyKey property will only accept a single color when creating a custom shape Form. So what does the TransperancyKey do? It represents the color that the Windows Form will not draw. That means that if you have your C# code set it to equal the contrast color, the result will be a custom shaped Windows Form. Behind the scenes the TransparencyKey is using API calls to get the window to ignore the given color. C# now handles all that for you, thus programming irregular-shaped Windows easy to do. TransparencyKey does have some downsides, one being that we can only specify one color of transparency, making anti-aliased images difficult to display. 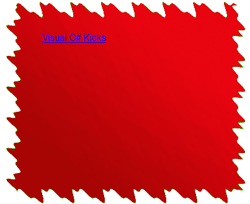 Another common problem is that under certain monitor color depths the effect will fail.